The MAX agent is deployed independently, and lives its life very happily that way: no matter where it is (on the Internet), it goes on its merry way sending information to your dashboard so you can always know about and maintain its health & well-being. With the features enabled, these machines will get all updates wherever they are. So, "out of the box," MAX would have each and every machine request and download features installers, patches, signatures themselves from the cloud. Even with the variance in check-in times from machine to machine, this can start filling up that pipe, making it appear that your service is "slowing down" your client's computers. So what can be done to ensure this situation doesn't happen? GFI MAX has a directly-integrated feature called a Site Concentrator. As with many of the features in your dashboard, this feature applies to and is configured at each individual site. (The name kinda implies that, doesn't it?) Typically, this corresponds to a contiguous Local Area Network, but doesn't necessarily have to be. The only requirement is that the Site Concentrator be accessible over its configured port from other machines within the dashboard site. 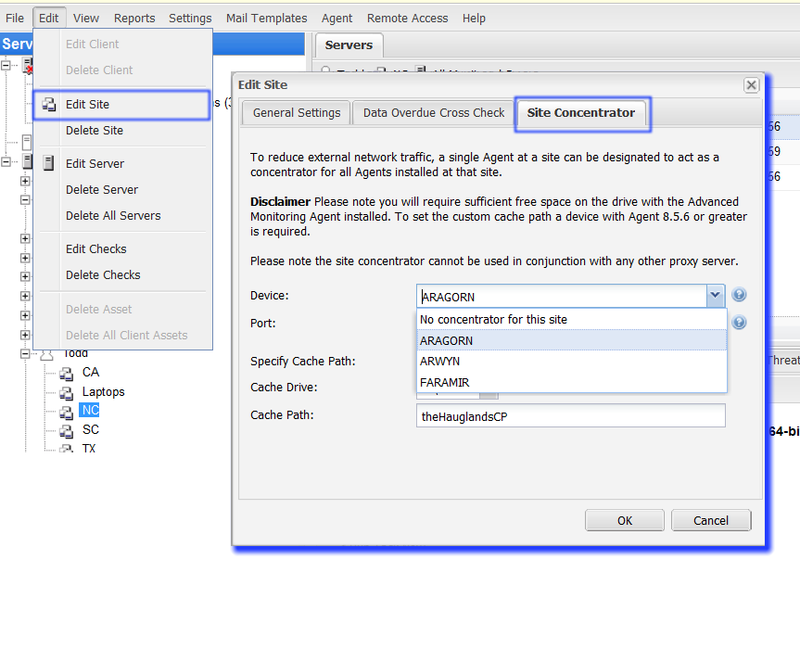 Configuration is simple: simply select the site you wish to enable a concentrator for, and select Edit Site from the Edit menu. The Site Concentrator is enabled on the third tab. Select a server agent from the site from the pull-down menu, and specify the port you wish to use and an alternate path to save the information if you'd like. By default, a "patches" folder will be created under the Monitoring Agent folder if you don't specify one. Any path you specify will be created if it doesn't already. Tip/Note: The patches / cache folder won't ever get much more than a few gigabytes in size, but you may want to move it to another drive just to avoid having a backup run on the folder. Any and all machines in the dashboard site will request these items directly from the SC and disseminate appropriately. Only one copy of a patch or update will be downloaded for the entire site. The Site Concentrator is self-cleaning, so in 30 days or less after download, the patches, etc. will be removed from the cache path automatically. Tip/Note: Only Server Agents can act as a site concentrator. 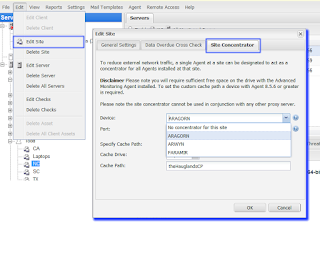 However, none of the features that utilize the Site Concentrator need be installed on the server agent computer. That is to say, one could use an "old" workstation computer, install the server agent on it with only the barest of monitoring checks (it would be good to ensure the machine is alive, wouldn't it?) and set it as the concentrator. No configuration changes are necessary on any agent within the dashboard site. As a matter of fact, if you need to move the site concentrator for any reason (e.g. server maintenance during a patch window), all you have to do is select another server from the list, and all systems will be updated automatically as they check in to the dashboard! Note: if you have a proxy server already set up for your client - and thus have it configured in your installation/ deployment of the Advanced Monitoring Agent, you cannot use a Site Concentrator. The truth is, though, you 3rd party proxy will act as a type of cache server anyway.